Hum Kishore festival (4th in the Series), an annual event organized by Urivi Vikram Charitable Trust to celebrate the competitive talent of adolescents in their co-curricular activities, was held from 19th to 23rd April, 2011 at three venues namely Urivi Vbikram National Centre for Adolescents (UVNAC), St. Columba’s School and PHD House. During these week-long celebrations, the Hun Kishore Festival engages a large number of students from as many as 63 Schools/Educational Institutions across Delhi/NCR. This year, prestigious St. Columba’s School has joined as a co-host. 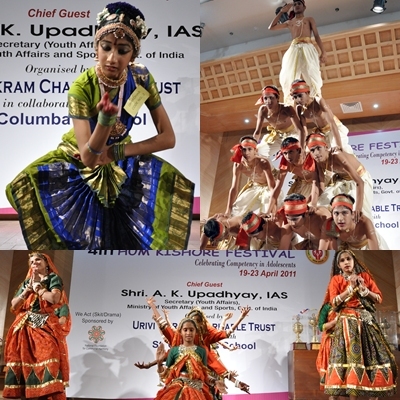 Starting with a series of competitions in painting, classical dance, instrumental Music, folk dance, singing, skit, elocution, debate, rangoli, create in best out of waste, essay writing, and standby comedy, the festival culminated into grand Finale showcasing the performances by the finalist. One of the contests ‘we act (skit/drama)’ was sponsored by National Foundation for Communal Harmony (NFCH). The teams offered for the various competitions are adolescents – centric and of current value, such as ‘protection of environment’ for Rangoli! ;`Discipline and Success are interlinked’ for Elocution; `Parental Control over adolescents is a Boon or Curse’ and `Grand Parents are a Problem or a Solution to the Adolescents’ for Debate and the like. Inaugurating the festival on April 19 ,Br.Leonard Lobo, Principal- St.Colamba’s School recalled how Julu tribal community of South Africa failed to know the value of diamonds found in their area till a priest told them so; and exhorted the participants to make best use of the opportunity given by the festival to show their artistic abilities. The Grand Finale of the 4th Hum Kishore Festival was celebrated on April 23rd with fervor day at Lakshmipat Singhania Auditorium, PHD Chamber of Commerce and Industry, in the presence of Chief Guest shri A K Upadhyay, IAS, Secretary youth Affairs (Ministry of Youth Affairs & Sports), Govt. of India. Shri Lalit Kumar, Secretary, National Foundation for Communal Harmony, MHA also graced the occasion. Shri Upadhyay watched the performances with great interest and appreciated the UVCT’s initiative giving a well dignified stage to Adolescents’ extra – curricular talent. He also encouraged the active involvement of schools in this festival to come year by year. He also pointed out that holistic growth is far more needed in children than their mere academic excellence. Appreciating the UVCT’s effort, Mr. Lalit Kumar stressed on the importance and need of the events like Hum Kishore Festival, especially for adolescents in India in the present scenario. Started in January 2008 with a tradition of putting together young people, the Hum Kishore Festival is packaged to provide them an open forum to showcase their creative talents and thereby helping them to hone their competitive edge, in field other than usual academics. In the first festival, only 7 schools participated whereas the 2nd ‘Hum Kishore Festival’ (14-18 January, 2009) attracted as many as 19 schools and 3rd Festival (20 – 25 April, 2010) has had 42 schools. Urivi Vikram Charitable Trust (UVCT), a non-governmental and non profit Organization, was established in India in 1991. It was founded by Dr U N B Rao, IPS and his wife, Urivi Chaya, in the memory of their only son Urivi Vikram, who died tragically in an accident at the age 21 years. UVCT has 11 centers functioning in five states – Maharashtra, Karnataka, Andhra Pradesh, Haryana & Delhi and alliance with a number of other organizations and institution. UVCT has also expanded globally with setting up of UVCT USA chapter. In the year 2008, UVCT accomplished a remarkable feat by establishing the first ever ‘National Centre for Adolescents’ named after Urivi Vikram and popularly called UVNAC. UVCT strives for the empowerment of adolescents and its priority target group comprises school-going children, drop-outs, under-achievers and underprivileged adolescents. UVCT has a motto of finding ways and means to transform the world’s ‘Burden of Population’ into ‘Assets of Human Resources’, through a process of empowerment, rather than of control. Dwarka Baat Cheet on ” Growth Challenges of Indian Economy” on 31st Jan.